That meant weaving potholders and selling them for 25 cents or finding soda bottles and taking them to the supermarket to collect the return deposit. This was in the small town of Inman, Georgia, where Reeves and her four siblings were raised. At times, the family struggled to get by. “I never went hungry, but we didn’t have indoor plumbing until I was 5,” she says. Her resourcefulness as a child set the stage for accomplishments as an adult. She holds the Cecil and Gwendolyn Cupp Applied Professorship in Entrepreneurship for the Department of Management at the Sam M. Walton College of Business and also serves as associate provost for entrepreneurship. By her count, 21 companies – some with a large number of employees – have been created by students who developed their ideas in her New Venture Development class. Those companies include consumer packaged goods, pharmaceuticals and solar power. 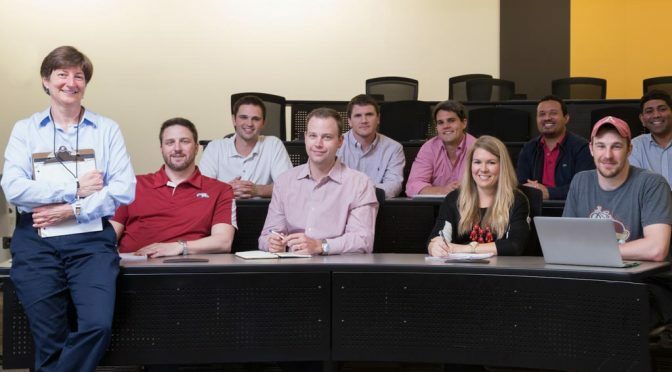 She also advises graduate level business plan teams, taking them to intercollegiate competitions both nationally and internationally with winnings totaling more than $2.2 million during the past decade. This makes the University of Arkansas the winningest school in the nation. Reeves is the recipient of the 2014 University of Arkansas for the SEC Faculty Achievement Award, the C. Sam Walls Entrepreneur Educator Award, funded by the Donald W. Reynolds Foundation and, most notably, she was named as one of the Top 10 most powerful women entrepreneurs of 2011 in Fortune magazine. However, she is quick to shift the attention elsewhere. Reeves says her interest in small business led to a doctorate in strategic management and entrepreneurship. The discipline, she says, can be utilized in so many ways and can even involve social issues. Reeves’ first job was as assistant management professor at the University of Miami. Yet, a visit to Fayetteville reminded her of her hometown in Georgia. She and her family enjoyed the scenic beauty of Northwest Arkansas and found its people friendly. In 1990, she began teaching at the Walton College and has stayed ever since. Of course, the Walton College also made an impression on her. “I think the faculty have always cared more about students here than at many other schools, which is nice,” Reeves says. Reeves finds herself feeling the same way about her current and past students.